Welcome to enchanting Riquewihr in Alsace, France, the first of many storybook villages on our journey through one of the most beautiful and picturesque regions of France, or the world for that matter. All photography ©Brian Jannsen Photography. Unauthorized use is prohibited. I am so excited to announce my Guest Photographer Brian Jannsen who is solely responsible for capturing the splendor of Alsace, France, in this article. As soon as I saw his Alsatian photo essay, I fell under its enchantment, and you will too when you see how beautifully he masters light to convey visual romance and warmth that is beyond words. 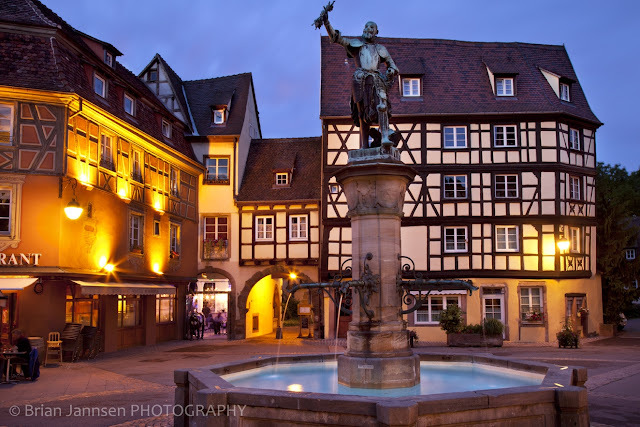 Join us on this photo tour through Alsace, France, and at the end of the article, you can read more about Brian’s photography and his tours through these and other enchanting places. Thank you Brian, for your gift of magic! Tucked in the northeastern region of France between the foothills of the Vosges Mountains to the west and the Rhine River and Black Forest to the east, the beautiful Alsace province is home to storybook villages, magnificent castles, one of France’s top producing wine regions, and is steeped in history and tradition. Roughly the size of Los Angeles and stretching from Strasbourg to Mulhouse, Alsace covers 8,280 sq. km. or 4,000 sq. miles and offers up the some of the most scenic landscapes and picturesque settings in France, not to mention one enchanting village after the next—each with its own unique story to tell. When you visit, you can’t help but feel like you’re stepping into the pages of a fairy tale as you walk down through the quaint streets lined with half-timbered houses, shops, cafes and more. It’s magical! Let’s not waste another moment and embark on our journey through the Alsace province in France. 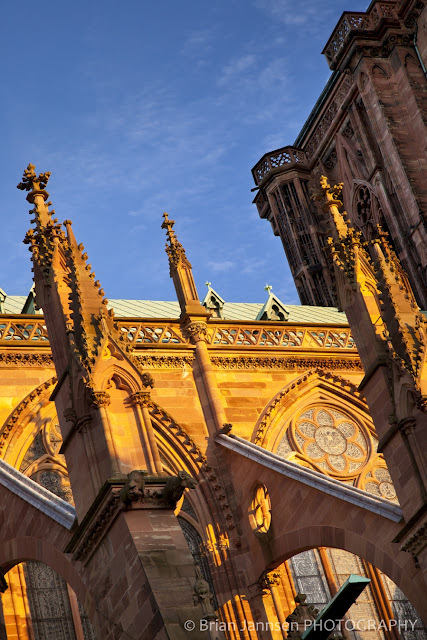 Steeped in history spanning 2,000 years, the Alsace region can trace its roots back to the days of the Roman Empire from whence it survived a tumultuous history through to the end of WWII. After Rome fell, it was known as Alemanni at which time the first Alsatian dialect was spoken. From there, it went on to become part of Austrasia in the 5th century and then under the control of the Holy Roman Empire until the 17th century. After enduring the French Revolution, it fell victim to a brutal 75-year-long tug of war in 1871 between France and Germany when possession changed ownership four times with France claiming victory at the end of WWII. Today, evidence of this blended heritage, both French and German, can be seen throughout the region through its architecture, museums, medieval castles, wines and people. Needless to say, Alsace remains a top destination for tourists and historians alike. We begin our journey at the northern city of Strasbourg, the capital of the Alsace and the oldest city in the province as well. From there, we journey south to Riquewihr, Kaysersberg and finally Colmar, the wine capital of Alsace. Anyone up for a toast? Capital city of Alsace and seat of the European Parliament, Strasbourg is the region’s oldest city and sits at the crossroads of Europe because of its central European location. Rich in heritage and traditions, the historic center of Strasbourg or Grande Ile, a UNESCO World Heritage Site since 1988, is the city’s oldest and contains the most historic buildings and monuments including the Strasbourg cathedral or Notre Dame de Strasbourg which was begun in 1015 and completed in 1439 despite its missing bell tower. Right now, it is the world’s sixth-tallest cathedral! Also, make sure you visit the Kammerzell House, famous for its well-preserved late-Gothic ornate architecture. There are many other discoveries awaiting in this Alsatian capital city of Strasbourg. Our Lady of Strasbourg Cathedral. All photography ©Brian Jannsen Photography. Unauthorized use is prohibited. After leaving Strasbourg and before arriving in the next village on our tour, Riquewihr, make sure you detour on D159 to the Haut Koenigsbourg Castle for jaw-dropping views of the Alsatian plain. Dating back to the 12th century, the castle was originally known as Staufenberg until 1192 when it became the Royal Castle or Koenigsbourg. Did you know there are more than 400 castles in every state imaginable throughout Alsace? Le Dolder Tower was built in the 13th century and intended to intimidate the enemies on approach to this village. Today, it houses an art and folk museum as well as tools and artifacts used in the region's wineries. All photography ©Brian Jannsen Photography. Unauthorized use is prohibited. Perhaps the most enchanting of the villages pictured in this article as well as my favorite is the town of Riquewihr with its 16th-century half-timbered houses lining the cobble-stoned streets that wind their way up and down the terrain—reminiscent of many a fairy tale picture book. Surrounded by its medieval city wall erected in 1500, Riquewihr is located in the midst of the best Rieslings in the Alsatian wine country so be sure to seek out the winstubs (vin-shtube) or wine cellars offering tastes of the region's finest. At the western gateway, stands Le Dolder, the 15th-century tower which today, houses an informative art and folk museum. Don’t miss the 14th-century Wurtemberg Castle, home to Alsatian Communication Museum, as well as the Tower of Thieves, a 15th-century prison. Beyond Riquewihr’s city walls lie the vineyards offering up many delectable wine-tasting tours. Take your time strolling along through Riquewihr and relish its enchanting Alsatian flavors. Just one of so many charming half-timbered cottages throughout the village of Kaysersberg. All photography ©Brian Jannsen Photography. Unauthorized use is prohibited. Located a few miles south of Riquewihr is Kaysersberg—a well-preserved medieval village that dates back to 1227. Resting at the foothills of the Vosges, Kaysersberg owes its existence to the Kaysersberg Chateau—a fortified castle upon its craggy summit built in the 1220s for Albin Woelflin, an imperial bailiff for Holy Roman Emperor Frederick II. Kayserberg Chateau guarded the only entrance to the mountains and the region of Lorraine that lies to the west. Together with the Vosges, the two provide a most dramatic backdrop to the architectural richness of this town. Renowned for its Albert Schweitzer Museum dedicated to the Nobel Peace Prize winner for his “Reverence of Life” in 1952, Kaysersberg is also famous among viticulturists for its Pinot Gris wines. Some of the best times to visit are during September for the grape harvest and during the holidays for its vibrant Christmas markets. Our tour of Alsace concludes with the wine capital of the entire Alsatian plain, Colmar whose history dates back to the 9th century. This last stop offers yet one more village with picturesque settings and Kodak moments around every corner—a photographer’s dream come true. Half-timbered houses are the norm and many ornately polished and in splendid condition. Weaving their way through Colmar, the canals of the River Lauch transform the city centre into a little Venice or “Petite Venise” as its known locally. Colmar is also birthplace to the sculptor Frédérick Bartholdi who designed the Statue of Liberty in New York Harbor and the Schwendi Fountain in the image above. Seek out the Cathedral Saint-Martin as well as the Unterlinden Museum to see the renowned “Isenheim Altarpiece” by German artist Matthias Grünewald who completed this masterpiece in the early 1500s. Whether you have kids or not, don’t miss the village’s Museum of Toys brimming with vintage collectibles from all over the world. On display are brilliantly created model trains and villages, miniature amusement park rides, and more! It’s fun and fascinating for kids of all ages! These are but four of the many villages spread throughout Alsace, France, from Strasbourg to Mulhouse so for now, this concludes our tour but I promise that this is the first of many more features to come including the Christmas markets—my next article. As I mentioned above, these photos were taken during one of the many photo tours hosted by Brian Jannsen, a renowned photographer whose award-winning work has been published in books, calendars and magazines including National Geographic, Lonely Planet and Frommers. No surprise there, right? 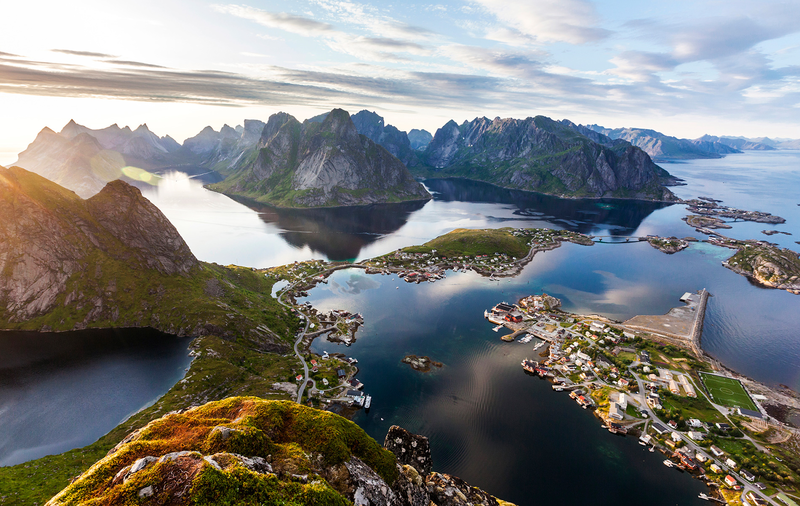 Brian facilitates photo tours throughout Europe and the U.S. all year long. These are not photography workshops per se, but photography tours through various regions and picturesque settings replete with perfect light, providing mother nature cooperates, so that you too, can come home with masterpieces like these. Photography Tours and Workshops: a complete list of upcoming tours. Want to see more of Alsace? Check out this two-minute video capturing the region’s highlights. By air: There are two international airports in Alsace: Strasbourg in the north and Bâle-Mulhouse in the south. Plus, Frankfurt and Zurich are close by as well. By train: It’s only 2 ½ hours by train from Paris to Strasbourg. By car: A35 will take you through the entire Alsace Region from Strasbourg to Mulhouse, approximately 118 km or 73 miles. However, I suggest you take alternate routes D468 / D2 or D1083 / D468 so you can meander through the countryside and see all this wonderfully idyllic region of France has to offer. An Alsace journey via Laurel of my ExpatGermany.com. Amazing pics! Looks like a fairy-tale destination... perfect for the Christmas season. Hi Leslie, I couldn't agree with you more. These pics are magical and quite captivating. Thx so much for stopping by to share your thoughts. Beautiful photos. Love the cottage shots, it feel like one of those storybook type of house. Warm and welcoming. Thanks so much. I too love Brian's photos in this post...they truly are magical! Thanks for stopping by and sharing your kind words. Dear Anonymous, I knew you wouldn't let me down. Thank you as always for stopping by and for your kind words. I can't express how much your continued support is deeply appreciated. Have a wonderful day and until next time, Au Revoir! Stunning photography. I've been to Strasbourg and loved it, now I just need to get to the rest of these villages you've mentioned, they look beautiful and full of character. Hi Laurel, On behalf of Brian, I thank you for the compliment on his stellar photography. His pictures really bring to life the enchantment of this entire region. Thank you for stopping by and sharing your thoughts! I'm loving these guest posts esp. the evocative photos...great stuff! Hi Lesley and thank you for those kind words. I was enchanted by these magical images the first time I saw them and just had to feature Brian's extraordinary work on my blog! He is a master of light like Kincade is painter of light! Thanks for stopping by and sharing your thoughts! Beautiful photos! I have not been to this area of France. I actually haven't explore much of France at all beyond Paris. This is a region I would love to go! Love the light and the colors in the Alsace region! 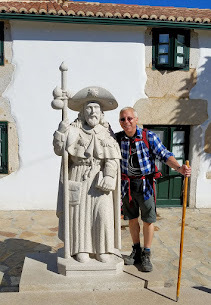 Hi Jeremy, I couldn't agree with you more...the villages are magical to say the least and Brian's photos really bring these places to life with warmth and enchantment. Thank you for stopping by and sharing your thoughts! Hi Jenna, glad you enjoyed the pics and post!! It's truly a magical region of France that everyone must see. Thank you for stopping and I will definitely pass your comment onto Brian as well. I will be going to this area for a couple of days in March. We're staying in Colmar, but I want to visit a couple of the other small towns. Seeing pictures like these makes me so excited for my trip! You are going to have a fantastic time! You will need to seek out the Schwendi Fountain in the the Colmar pic from above. Thanks for stopping by and sharing your excitement for your upcoming trip! Au Revoir! These pictures are just as marvelous as yours. They really bring the towns of Alsace Lorraine to life. These two names everyone knows from hearing in history classes from middle school through college. Hard to believe names so infamous can be so magical. Ted, I am honored by your compliments my friend! Brian's photos are indeed extraordinary and to be compared to him is quite an honor! Thank you for stopping by and your kind sentiment! Amazing photos. Alsace is definitely one of the most picturesque regions in France! HI there Marie-Eve!!! Thanks so much for stopping by and I couldn't agree with you more...I fell in love with Alsace when I saw these photos ! Hence the inspiration behind the post! Actually, I love all of Brian's photography...he truly is the master of light and lens. Thx again for your comments! Enchanting, simply enchanting. I can look at these photos every time and still be amazed. Hi there Marlys and thx so much for the compliments. I will be sure to pass them along to Brian - the master of light and lens! Thx for visiting my friend! Wow, I'm in absolute awe of the photos here. Thanks for the inspiration of some new destinations in the Alscace for a summer weekend drive not too far away from me! Hi there Troy and thanks so much for your kind compliments! I will be sure to pass them on to Brian!! I can't believe you live so close to Alsace!! It must be wonderful!! Thx for stopping by to share your love of Alsace! Hi there Tim and thanks so much for stopping by! As you know, Rouen is due west of Alsace but I agree with your comments nonetheless. 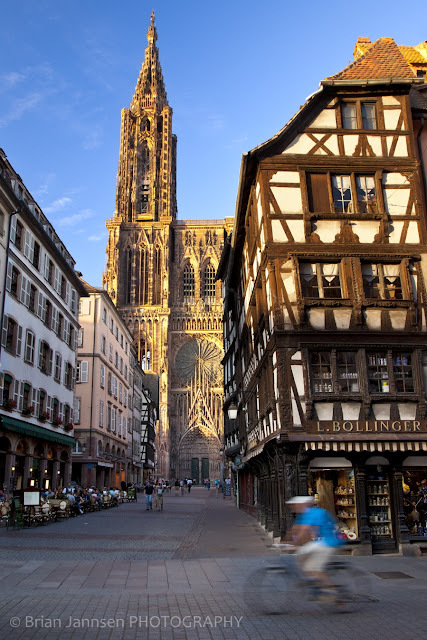 I was so into Strasbourg and Alsace after my first visit there. 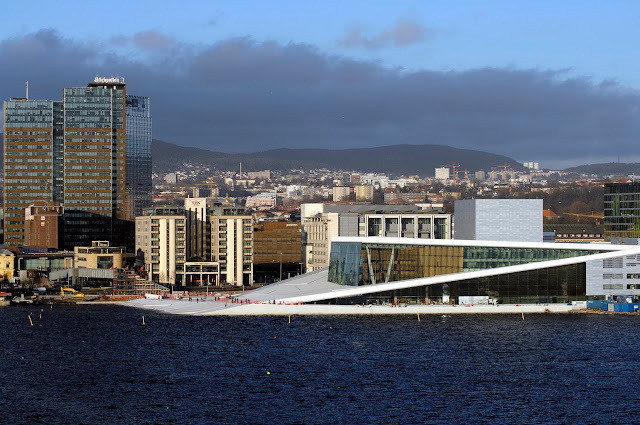 The architecture's amazing! Planning to visit Colmar this month! Hi Elena! You must have had a wonderful time and you're going back as well! I am jealous. Have a fabulous time and stop back here to let me know all about the great time you had! Thank you so much for stopping by! I loved reading this post ad seeing the photographs! We are heading to Alsace in November and staying in Strasbourg. I am looking forward to exploring the region and now you have introduced me to some other spectacular sights to put on our itinerary. Thank you! Thank you so much for your stopping by and sharing your thoughts! How exciting that you're going to be in Strasbourg in November. I will be visiting there as well as Colmar in two weeks. Lots of Alsace adventures await both of us! Enjoy my friend! Thank you for your kind words but all photo credit for THIS post goes to Brian. I call him the master of light and lens for he transforms these scenic views into pure magic! Thank you so much for stopping by! !